Join us on Saturday, July 21st as we celebrate the 25th Anniversary of “The Sandlot” with a VERY special guest. Last year we were lucky enough to have “Squints” at the ballpark and everyone had a night they will remember FOR-EV-ER. 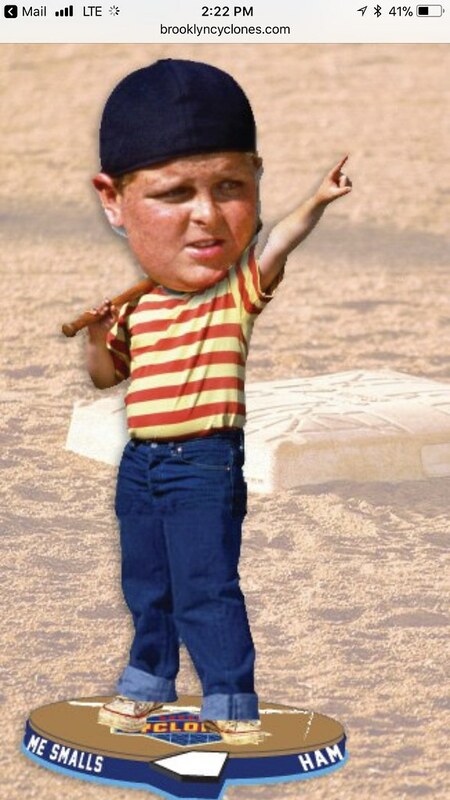 This year we’ll have s’more fun with a special appearance by Patrick Renna who played the role of “The Great Hambino.” Patrick will pose for photos with fans on the concourse during the game. As part of the celebration fans will be able to purchase a limited edition Hambino Bobblehead package for $25. The only way to receive the bobblehead is by purchasing this package, the item is NOT a general giveaway.. There will also be a special Meet & Greet package that will be the ONLY WAY for fans to get an autograph from Ham Porter. This package is $50, includes a bobblehead, game ticket and a chance to take a photo and get an autograph from “The Great Hambino” himself. This is VERY limited, so act quickly before it sells out. Limit of 4 per person. These limited edition packages are available EXCLUSIVELY at BrooklynCyclones.com.